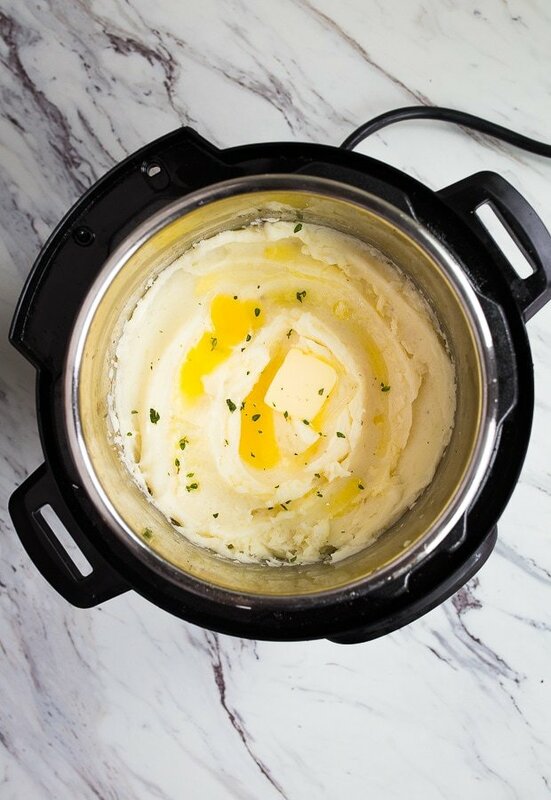 Instant Pot Mashed Potatoes for Two. If you’re doing a small Thanksgiving for Two, can I recommend adding these to the list? It makes two generous servings of mashed potatoes. Ok, maybe 4 normal servings. To date, there are too many people in my life that have confided in me that while they own a pressure cooker or Instant pot, they’re too afraid to use it. They want to know how to get started, will it explode, and what’s the first thing I should make? Normally I answer those questions by recommending my instant pot chicken stock or instant pot applesauce. Oh, and I also recommend reading the manual, joining the Instant Pot Official Facebook page, and watching a few YouTube videos on how to use it. No, it won’t explode–there are safety features in place that were lacking in previous pressure cookers of the past. 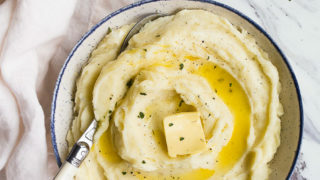 But now, after tasting these mashed potatoes, I say instant pot mashed potatoes for two is the best place to start with your Instant Pot. As you know, or maybe you don’t, I share all small scale recipes for two people on this site. All of my desserts and dinners for two make two servings. Well, some make slightly more than two servings, but definitely less than an original full-size recipe, I promise. For this reason, I have the instant pot *MINI*. It’s the 3-quart model, and it’s perfect for cooking for two. This is the exact Instant Pot Mini that I use now. I always recommend starting with something basic that only has a few ingredients if you’re new to the Instant Pot. 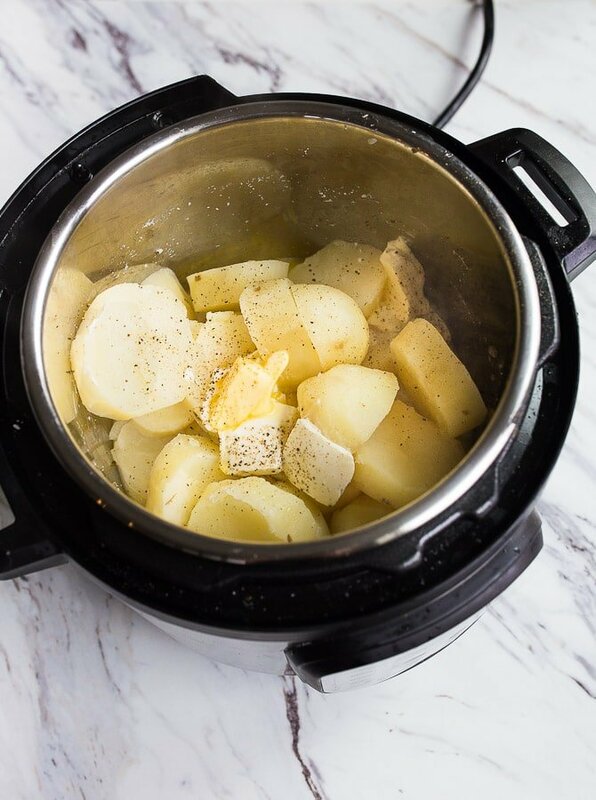 Creamy instant pot mashed potatoes for two only has 5 ingredients, not including salt and pepper, and is so simple! I toss a garlic clove into the pot with the raw potatoes. 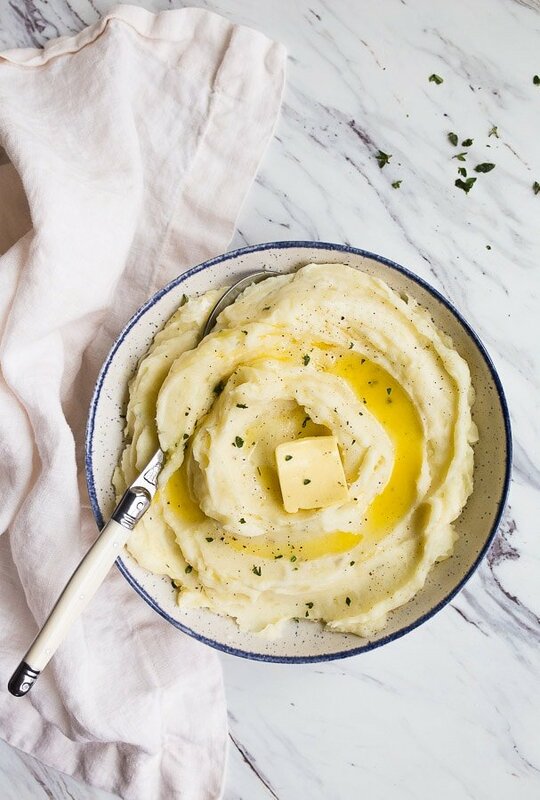 We love the subtle flavor, but if you’re a mashed potato purist, leave it out. Garlic powder can also be good stirred in after cooking. You’ll want to heat the milk, butter and cream cheese slightly before adding it to the pot. To do this, chop the butter and cream cheese into small pieces, pile them in a 2-cup measuring cup and microwave it for just about 30 seconds. It shouldn’t boil or simmer, it should just take the fridge chill off of them. For the actual mashing of the potatoes, if you’re going to use a hand-held masher, it’s best if it’s silicone or plastic, not metal. I don’t want you to scratch your instant pot insert. The most recent time I made these instant pot mashed potatoes, I used my hand mixer, but I was careful to not let the beaters touch the sides or bottom of the bowl. The potato mixture is so soft and fluffy, it’s easy to do and only takes about 15 seconds! Plus, it ensures the garlic clove gets thoroughly incorporated. Cream cheese in mashed potatoes? Yes, because The Pioneer Woman taught the world that cream cheese belongs in mashed potatoes. I’m not here to argue. This recipe uses just 2 ounces of cream cheese. Save the rest for my loaf pan cheesecake. You can use sour cream or whole milk plain Greek yogurt instead of cream cheese, if you prefer. 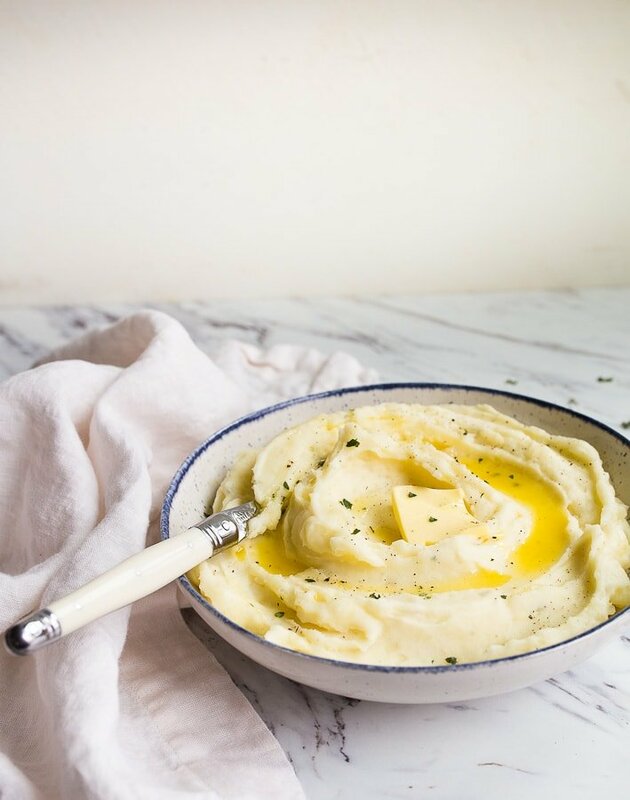 I hope you love this recipe for mashed potatoes for two made in the Instant Pot. 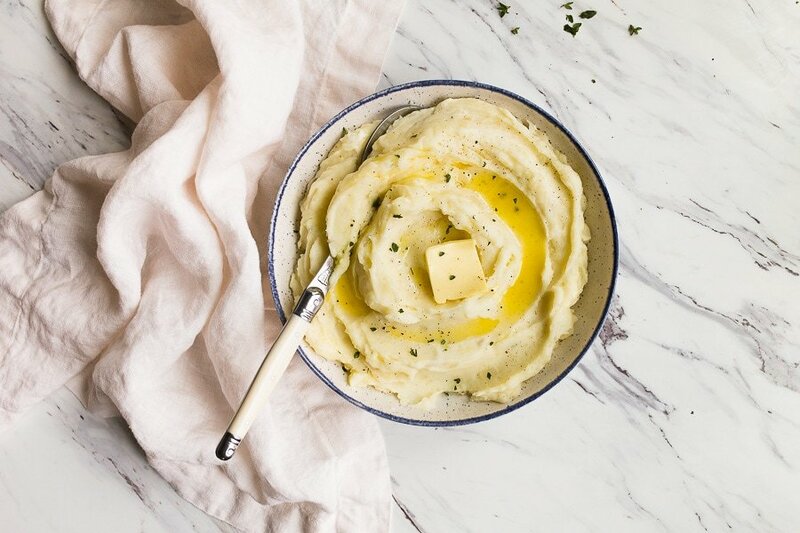 I love that the ‘warm’ function can be used on the Instant Pot, keeping these mashed potatoes warm for a long time without a need to preheat. 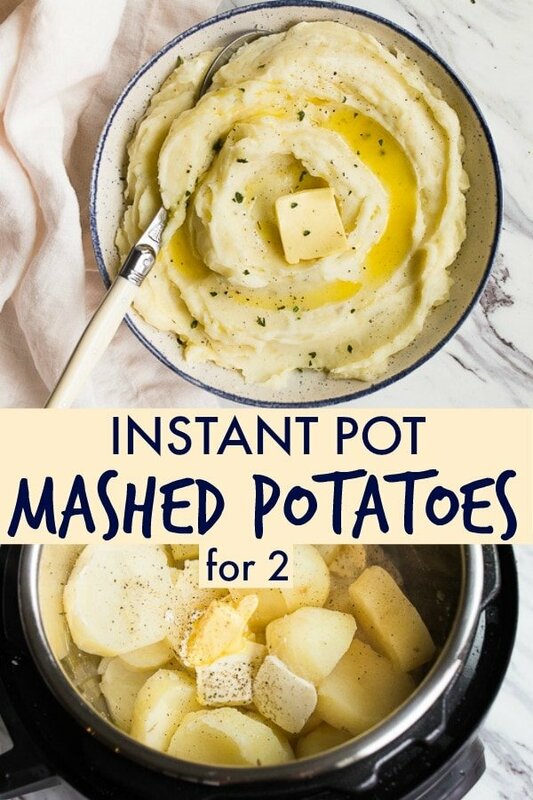 Instant Pot Mashed Potatoes for Two made in the Instant Pot mini. First, peel the potatoes and then slice them into 5 or 6 big slices. Place them in the Instant Pot. Pour 2 cups of cold water over the potatoes. Add the garlic clove and salt. Place the lid on the Instant Pot, turn the valve to SEAL. Press 'PRESSURE COOK' and then set the timer for 8 minutes. It will take about 10 minutes for the potatoes to come up to pressure before the 8 minute count-down begins. Once the timer goes off, carefully use a towel to do a forced pressure release (which is just manually turning the valve to VENTING instead of SEAL). Be careful--the steam is going to spray out quickly! Keep your hand and arm covered with a towel and stand back. When the valve drops, remove the lid from the pressure cooker. Then, carefully drain the excess water from the pot. You can pour the potatoes into a strainer, or just tilt the pot over the sink with a strainer to drain out the water. Put the potatoes back in the pot. Next, chop the butter and cream cheese into cubes. Place them in a microwave-safe dish, pour the milk on top, and heat for about 30 seconds in the microwave just to take the chill off. Pour the milk, butter and cream cheese mixture on top of the potatoes. Then, using a non-metal potato masher, mash the potatoes and incorporate everything together. (I've used a hand-held mixer and very carefully avoiding touching the sides and bottom of the pan). Taste and add more salt (if needed) and plenty of freshly ground black pepper. Serve with chopped fresh parsley and extra pats of butter on top. Yup! I’m adding this to my Thanksgiving meal! I can’t even imagine how yummy the infusion of garlic is going to be since it’s cooked with the potatoes. I’m actually the only one, of our 4 person holiday, that wants mashed potatoes. I’ve had a pressure cooker for just under a year and use is weekly for a few different recipes. I haven’t explored too much, so I have a question on Step 6. How do I drain the excess water from the pot before the valve drops and I open the lid? This may sound ridiculous, but you mention draining the excess water…THEN in a later step you say once the pressure valve drops, add the milk/butter etc… So, is there a way to drain the excess water without removing the lid? Because if you remove the lid to drain the water, won’t the pressure valve already be dropped? I’ve only used mine once or twice, so I’m wondering if there is a trick to draining it without removing the lid?? Thanks! Recipe looks great! 5. ….Then, carefully drain the excess water from the pot. 8. When the valve drops, remove the lid from the pressure cooker. Pour the milk, butter and cream cheese mixture on top of the potatoes. I am going to try this tonight with cube steaks/gravy that is already in slow cooker! So, why can’t you use a metal potato masher? Because it might scratch your instant pot.